Good hair products are sometimes like finding a needle in a hay stack, however, once you find a brand you get on with you have hit the jackpot. I have gone through a variety of brands Aussie, Schwarzkopf, L'Oreal... I like most of their products but it can be a bit of a hit or miss with some. 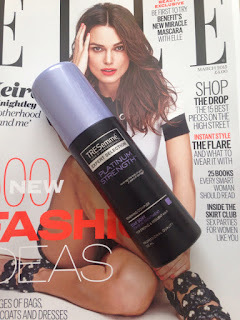 TRESemmé is a brand that I have always got on with, I don't think I have ever not liked one of their products and they always smell incredible!! I have used TRESemmé's shampoo and conditioners more than once, as well as their hair care treatment products. I picked up the Platinum Strength leave in treatment a while ago and I am very happy with my purchase. What the product says: Tresemme Platinum Strength Leave In Conditioner strengthens hair and locks in moisture leaving your hair soft, manageable, and ready to be styled. The result is beautifully strong, moisturised and healthy-looking hair. What it actually does: My hair feels so much softer and silky since using it, if even feels lighter and thicker than before. I love how my hair feels, it looks all shiny and new like after you have been to the hairdressers. I think my hair definitely looks healthier and revitalised. Is it worth buying again? It costs a little over £5 and has done wonders for my hair, this is the second time I have bought and would repurchase it again.